The purpose of the leaflet is to define a uniform framework governing the design of European stations to ensure consistency in the measures taken to facilitate access for the mobility impaired. Participating establishments will form a stations network facilitating the mobility of persons in Europe and making train travel more attractive, both of which remain key UIC aims (see point 1.2.3 "the accessible stations concept"). These stations may be referred to as accessible stations providing they meet the accessibility requirements laid down in this leaflet. "People with Reduced Mobility" (PRM) means all people who have difficulty when accessing railway infrastructure. Account should also be taken of those people for whom travel is difficult owing to their circumstances such as individuals accompanied by young children or loaded down with shopping bags, parcels or luggage. Indeed almost all of us at some stage experience varying degrees of reduced mobility, which is why a well-designed railway transport chain fosters the growth of travel by train. This leaflet addresses aspects affecting accessibility and the standards governing achievement thereof. It also defines the accessible stations concept. The application of fundamental standards should take on board the special requirements affecting railway operations to guarantee safety and order. It should also take on board the objectives pursued by carriers and passenger terminal managers as customer-driven service companies. It is important to draw the attention of carriers and passenger terminal managers to customer requirements in terms of cleanliness and safety. Proper and gradual implementation of these standards will pave the way for comfortable travelling conditions at European level and, by extension, will make life easier for senior citizens and the mobility impaired. 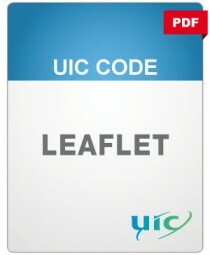 Hence, the leaflet is of vital importance for carriers and passenger terminal managers. Appendix A lists and explains all sketches and standards. Appendix B contains statistics concerning the travel habits of senior citizens in Europe.